The Houghton scale is a 4-item instrument that accesses prosthetic use in people with lower extremity amputations. It reflects a person’s perception of prosthetic use. It's self-administered and easy to score. 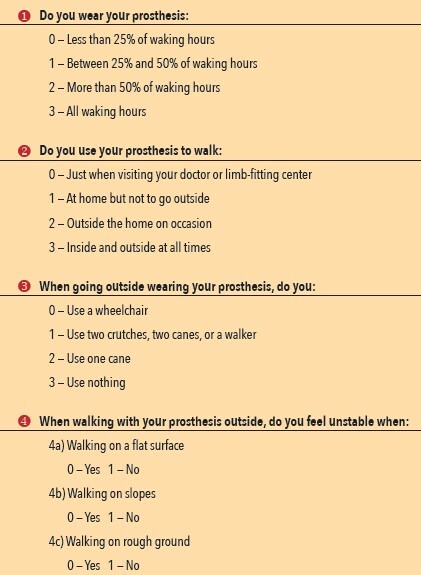 The first 3 items are scored on a 4-point scale and it attempts to capture prosthetic wearing habits whilst the fourth question has 3 dichotomous (yes/no) items that assess a patient’s comfort level when negotiating different outdoor surfaces. Results are reported as a total score out of 12, with higher scores indicating greater performance and greater comfort. It defines community and household walking ability. Miller et al compared the Houghton Scale with the Prosthesis Evaluation Questionnaire (PEQ) and the Locomotor Capabilities Index of the Prosthetic Profile of the Amputee (PPA) and concluded that Houghton Scale had modest internal consistency, good test retest reliability, and was the only scale tested that could discriminate between people with transfemoral and transtibial amputations. ↑ 1.0 1.1 1.2 1.3 Devlin, M., T. Pauley, K. Head, and S. Garfinkel. 2004. Houghton Scale of prosthetic use in people with lower extremity amputations: Reliability, validity, and responsiveness to change. Archives of Physical Medicine and Rehabilitation 85 (8):1339-44. ↑ Wong, C. K., W. Gibbs, and E. S. Chen. 2016. Use of the Houghton scale to classify community and household walking ability in people with lower-limb amputation: Criterion-related validity. Archives of Physical Medicine and Rehabilitation 97 (7):1130-6. ↑ Miller WC, Deathe AB, Speechley M. Lower extremity prosthetic mobility: a comparison of 3 self-report scales. Arch Phys Med Rehabil 2001;84:1432-40.